… but it’s still highly relevant. I’m also very sorry if this is the first time you’ve seen these warnings because the trouble in markets is now well under way. But please read this carefully if you want to rationally consider the risks on your money and before you talk to your usual financial adviser. And please be especially wary of financial advisers / wealth managers (or bloggers) who tell you to ‘relax’ and ignore the markets. That sort of attitude might be fine for some of the time but is NO use at all when markets get ahead of themselves as they have done in recent years. 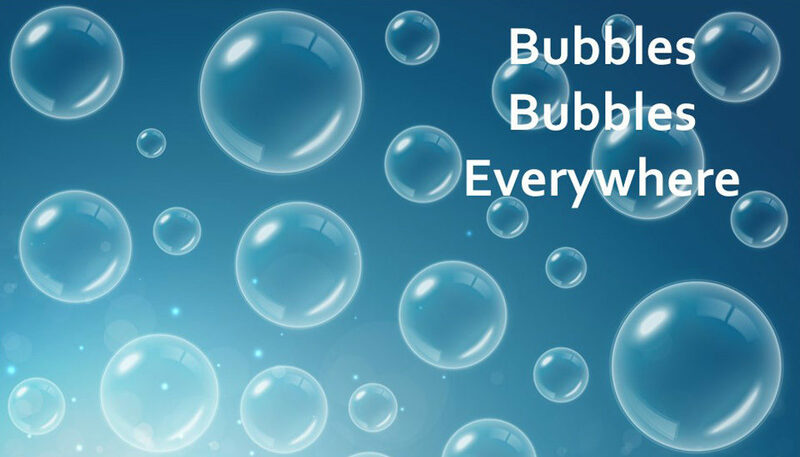 As any reasonable person can see, bubbles do ‘blow up’ from time to time – in the prices of bonds and equities (aka stocks) and houses and commercial property. And right now, all of these assets are sitting at absurdly high prices for one simple reason. Central banks have distorted the markets by taking the returns on your ‘safe’ alternative (Cash deposits) down to zero. Before the last few years, interest rates have never – ever – been held at these super low levels. So, if your adviser tells you that these times are ‘normal’ or they try to assure you that they know exactly how this interest rate experiment is going to play out . . .
. . . get a NEW adviser. And no one, repeat, NO ONE knows what will happen next. All we know is that the risks in markets are high right now. Well, although most people haven’t heard of John Maynard Keynes it’s worth remembering that he was (and still is) considered by many to be one of the greatest economics thinkers of all time. 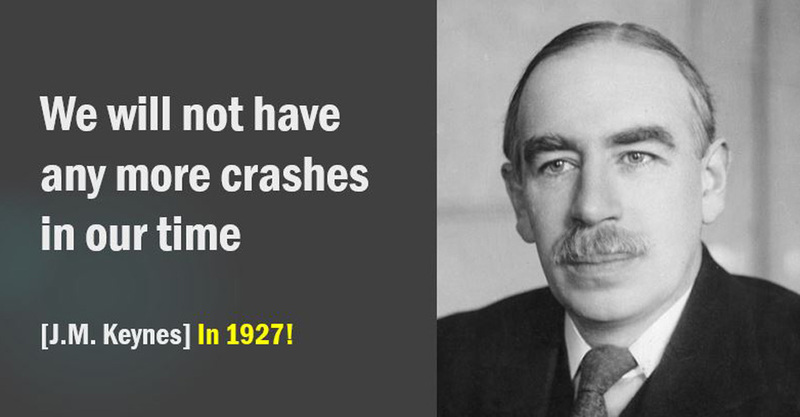 And he made that ‘don’t worry’ type of statement just 2 years before the start of the great depression. 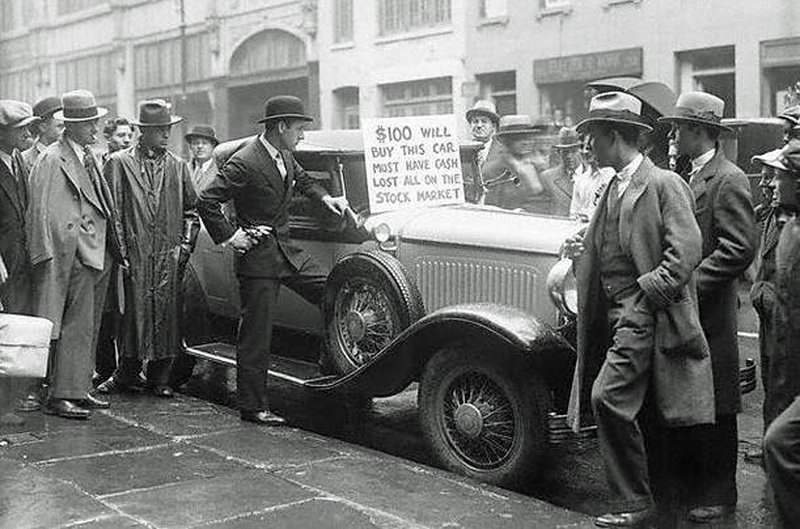 Between 1929 and 1932 the price of the wider US stock-market fell by 85%. What’s more, a lot of companies listed on the US Stockmarket went bust in that depression. So, investors in those particular shares lost 100% of their money. So, my first message here is that calming words from experts count for nothing when markets go haywire and investors panic. Interestingly, from the middle part of 2016 the ‘experts’ started warning us about the increased risks in markets. In the Financial Times, October 14, 2016, Gillian Tett shared the concerns of Axel Weber (head of UBS and former head of Germany’s Bundesbank) about what’s really shaping markets now. Their shared concern – in a nutshell – was that . . .
and “this point needs to be proclaimed with a megaphone”’, said Tett. I agree (and have done for some time) and I think most informed commentators agree too. The actions of the world’s central banks have distorted markets for years but we’re only now waking up to the RISKS of their actions. Holding down the cost of borrowing money (interest rates) has seriously pumped up the price of other assets. Both here and in the USA, serious experts are deeply concerned about market risks. The Office of Financial Research (an independent arm of the Treasury in the USA) has cited the record-high valuations in the US stock market. And they’re concerned that the very high recent returns – alongside low volatility – have encouraged investors to load up on riskier strategies . . . which could unravel in a tumultuous trading environment. “We know that markets work in cycles. Booms end; corrections happen. This is not a new worry though. 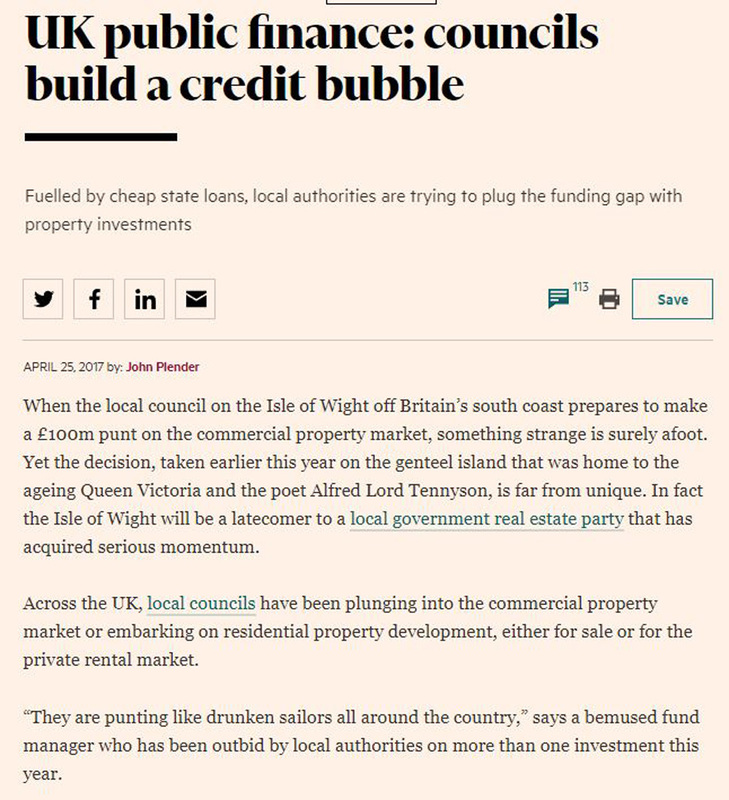 Meanwhile, back here in the UK, there are worrying signs of a bubble in commercial property – with local councils adding to the ‘froth’ – see here. You may recall that councils were heavy depositors of taxpayer funds in risky Icelandic banks before the last big crisis – in 2007. And the prices of shares (equities) and bonds are at all time highs – worldwide too. Here’s are the two key images from Deutsche Bank’s warning note in September. Even the normally ‘bullish’ Goldman Sachs are now giving a similar warning. See chart below. And, according to the FT, Brian Levine, co-head of global equities trading at Goldman Sachs, emailed their bigger clients on friday 9 Feb 2018 to warn that the market has probably still not hit its bottom. 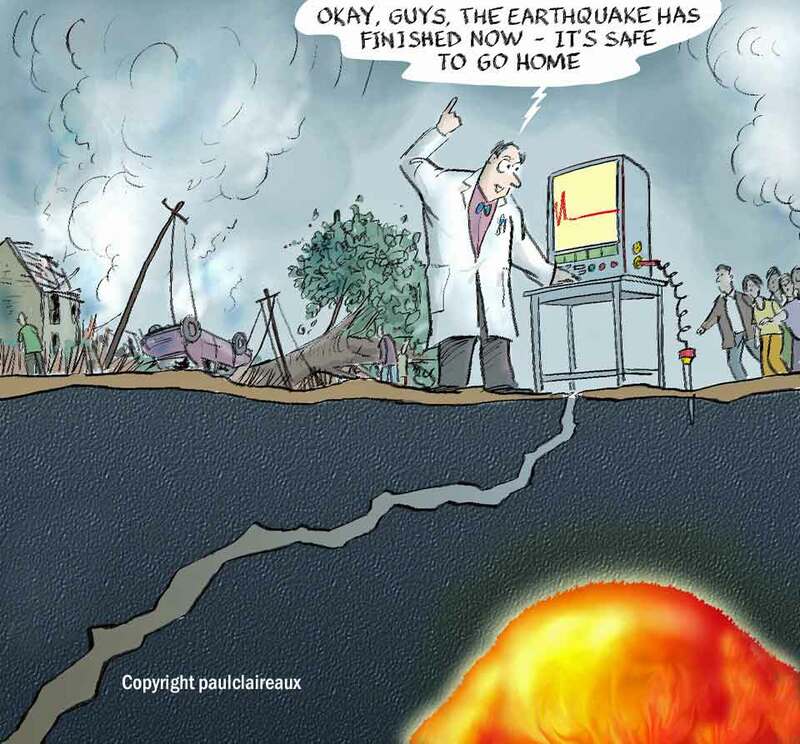 “Historically, shocks of this magnitude find their troughs in panicky selling,” he said. “I’ve been amazed at how little ‘capitulation selling’ we’ve seen on the desk . . . So, whichever way you read it – shares and bonds have not been this expensive at the same time for more than 100 years – and possibly a lot longer. Prices are clearly ‘off the scale’ against any normal measure. European junk bonds yielding less than safe US Treasuries! Triple-leveraged exchange traded funds attracting gigantic inflows. The 57 year old fund manager said that current equity valuations represent a bubble the likes of which he had only witnessed a couple of times in his career. So, it seems to me that the central banks of ‘so called’ developed countries have let this super low interest rate ‘game’ run on way too long. They’ve painted a lot of investors into a corner – and I don’t think they know how to get out of it either. Which means that financial markets could get seriously messy as investors scramble to get out of their positions. The key point here is that leading investment bankers and fund managers are issuing warnings – which means there could be cause for concern and it’s worth looking at more evidence. Of course, we can’t tell how long this expansion might run for but it’s clearly ‘long in the tooth’ already. Has it all come from the ‘white heat’ of technological advancement? Well, yes, some of it has for sure. 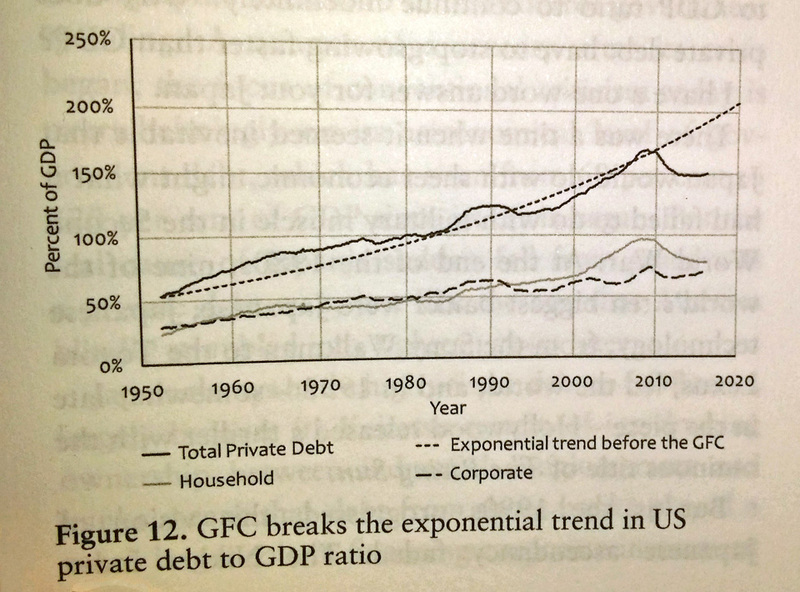 But if you read Professor Steve Keen’s excellent new book, ‘Can we avoid another financial crisis?’ you’ll find . . .
. . . these charts which reveal another, more disturbing reason for it. The sad truth is that a lot of the growth we’ve experienced in recent decades, has been an illusion. 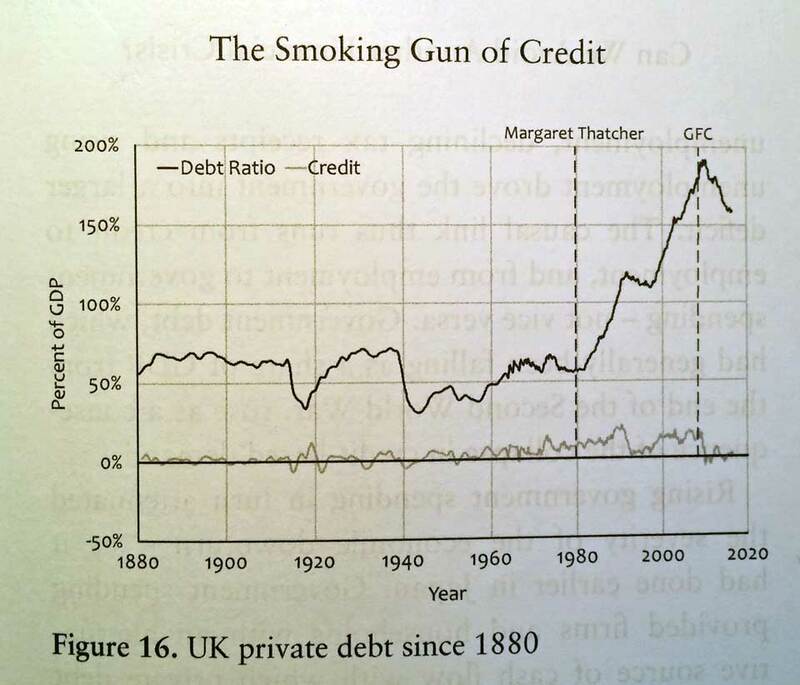 It’s come about because of consistently increasing levels of private debt. And that’s not a trend that can carry on indefinitely. Now whilst borrowing generally has been ramping up for 30+ years – there’s another shorter term indicator to worry about here. This investor borrowing level has ‘flashed red’ before previous crashes and is flashing bright red now. Indeed it’s been flashing RED since around 2013. You might say, that this only proves that, like earthquakes, hidden pressures in market systems can build, but we will never be able to predict when a crash will strike. Incidentally, we know from the data that the frequency and size of stock market moves are similar to those of earthquakes. and that’s contrary to what is taught to investment advisers in their exams! So, that’s a big issue and one I’ll come back to another time. Sign up to Newlsetters to hear more about that. However, what we know for sure is that markets do crash (very quickly) from time to time. What other clues are there to the risk of this trend reversing. 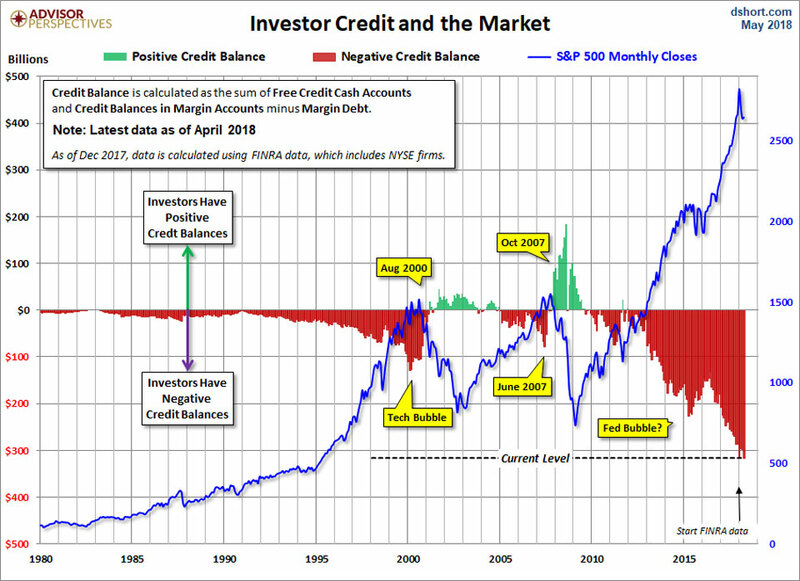 Well, here’s a chart (from Doug Short at Advisor Perspectives) on ‘margin credit’ which shows how much investors are borrowing . . . to invest! And this tells a very powerful story. Notice how the blue line (of the US stock market) has a nasty habit of overheating (ramping up) and then crashing. 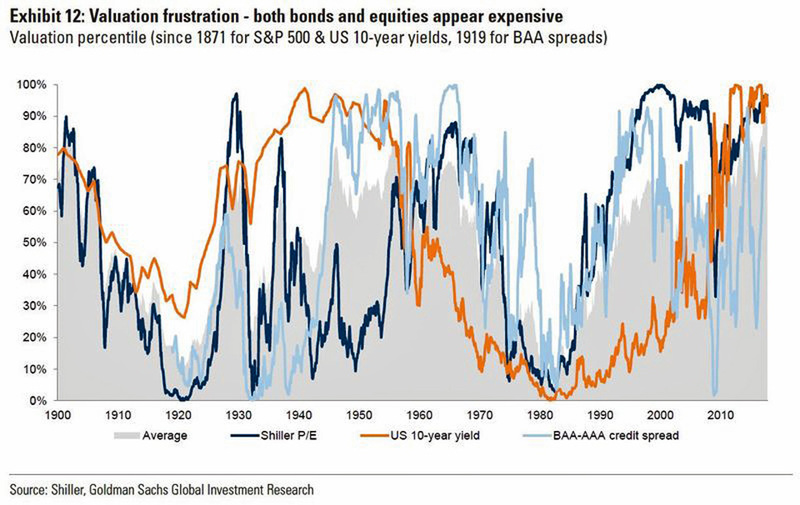 Clearly, investors have borrowed heavily in recent years. And who could blame them? The cost of borrowing has been at all-time lows. Borrowing has been mega cheap – whilst the return on your money left in the bank has been mega awful! So, there’s been a double incentive to borrow to invest! 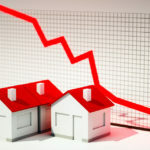 Of course interest rates are super low at the moment – and whilst they could possibly stay low a while longer . . .
. . . medium and longer term borrowing rates have moved up quite sharply over recent weeks in the USA – and have started edging up in the UK too. And according to the bank of england (Feb 2018) short term interest rates could rise “somewhat earlier and by a somewhat greater extent” than was expected just three months ago. our current, short-run calm could come at the expense of long-run turbulence. They clearly realise that raising rates too quickly could cause a panic in markets that have grown used to cheap central bank cash . . .
. . . but they also don’t want delays to rate increases if they’ll mean rates having to rise further and faster to prevent the next crisis. So, in a nutshell . . . The mood music around interest rates has changed – and quite dramatically now. The cost of borrowing could carry on rising for a while – and as investors see better returns on nice safe money held in the bank . . . the double incentive to borrow goes into reverse. So, the borrowing (aka ‘leveraged’) investors will want to cut their borrowings. And, as you can see from the chart above (the red bars, right hand side) they started doing so in 2016. Then, for some reason, they got excited again (about the prospects for even more gains) and started borrowing again – to buy back in. Perhaps someone told them that Donald Trump could get the stock-market to ‘defy gravity’ for a little longer. The key point to note here is that big market crashes tend to come, when those borrowing investors ‘cash out’ of their shares to pay back their debts. So, this is potentially a very nasty situation. Yes, it’s fair to say that some big risks in stock markets never materialise – but let’s be honest . . . this is one more key indicator that’s not looking good right now. Now before we get into this one – let’s be clear about one thing. 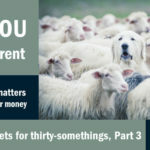 If you don’t yet have a large sum invested and you’re saving regularly over the long term – then this issue may be less of a worry for you. 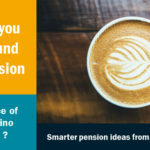 Indeed, a big market correction early on in your regular savings journey, could very well be to your advantage – as you get to buy in at lower prices. On the other hand if you do have a lot invested in the markets and, especially if you might want to cash in some or all of that over the next few years (perhaps for your retirement income) then market risks are more important as I explained here. Asset price parties usually end abruptly. And with the BIS questioning the wisdom of the current party – it could end sooner rather than later. Remember that the US stock-market is up by c. 300% (including reinvested income) since March 2009. The UK stock-market is up by c. 200% on the same basis. So, these have been incredible returns compared to what you’d have earned from money at the bank. And whilst that’s all very nice for those lucky enough to have been fully invested over that time – the question for investors is . . .
Can such returns be repeated from now? Well, as you may have guessed, I’m in the camp of people who think that’s unlikely. Yes, it’s possible but it seems extremely unlikely given how ‘stretched’ the valuations are today. 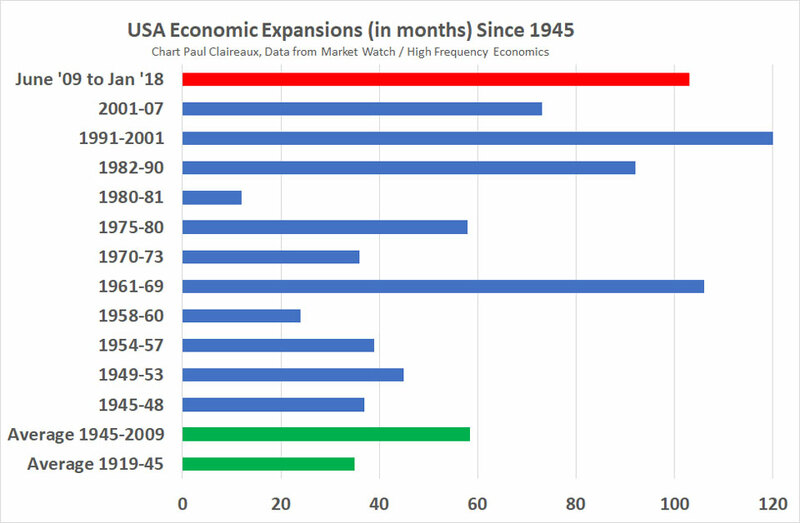 We need to remember that – the US stock-market has only been up at current valuation levels on two previous occasions in the past 130 years. As you can see, those years were 1929 and 2000 – and both occasions were followed by a crash! 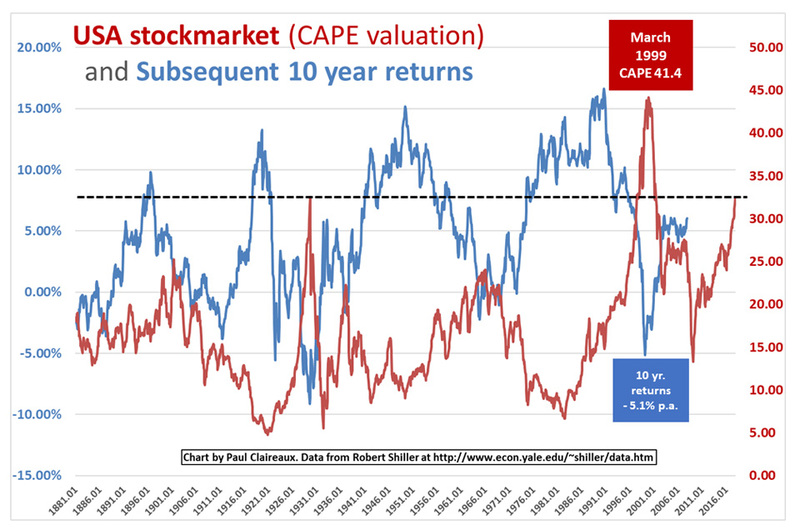 But for now it’s worth knowing what Professor Robert Shiller – the Nobel Prize winning creator of the CAPE indicator is expecting as a return on the broad US stock market going forward. Earlier in 2017 he offered the view that real returns on the US stock-market would be around 1% p.a. over the next 10 years. Deduct ‘typical’ charges for most retail investment products from that – and it means Zero or negative real returns for most investors if he’s right. Obviously there’s no certainty in that estimate – and returns could be higher or lower than that. 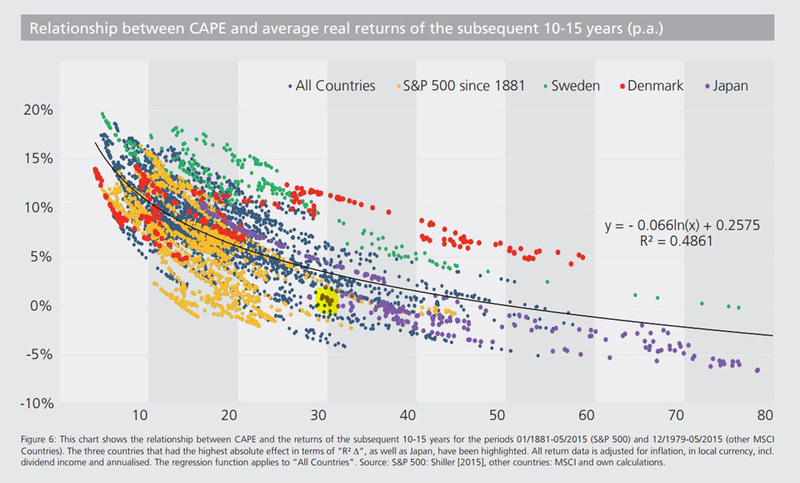 And this picture borrowed this useful paper from Star Capital gives you a feel for the range of investment returns that have occurred in the past depending on the Shiller CAPE starting point. I suggest that you ignore those ‘outlier’ red dots for Denmark which are probably there to make a point about unpredictability ! These show the returns from the world’s largest stock markets of the past 50 years (The USA and Japan) – and I think give you can idea of how Professor Shiller arrived at his estimate of 1% p.a. So, what does all this mean for YOUR money? Well, that, as ever depends on your capacity to endure market downturns. And, without knowing anything about your personal situation – no one can advise you on it. However, I think we can say that if you take Shiller’s ‘next to nothing’ (real terms) central estimate for returns on the US stock-market over the next 10 or so years . . . 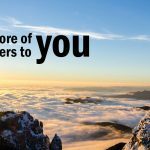 The bottom line – as ever – is that YOU must decide, with or without guidance, what to do with your money. My general guidance about investing is very clear and it’s this. The right answer depends completely upon your personal circumstances. 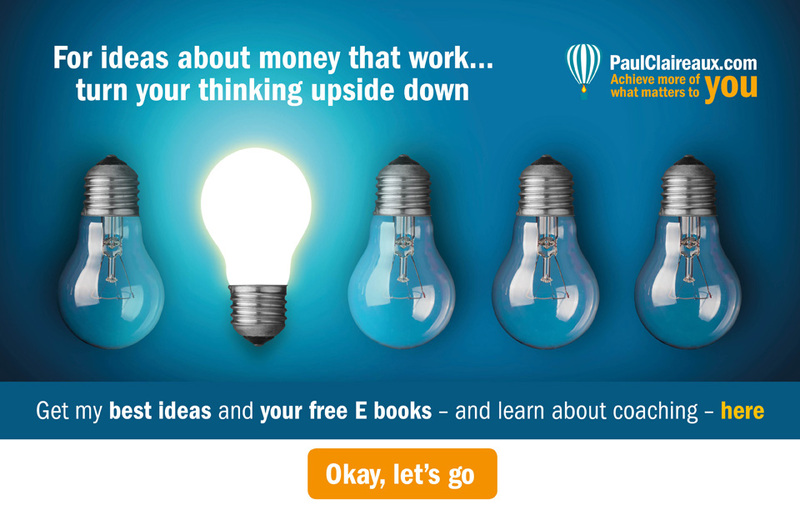 There’s no silver bullet and no single investment to suit everyone’s situation. So, when you think about your investments, you need to understand your own personal ‘appetite for investment risk’. 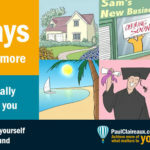 And, more importantly, you need to understand your own, personal ‘capacity for loss’ on the funds you’re allocating to each of your investment goals. Only when you know these things can you invest intelligently. 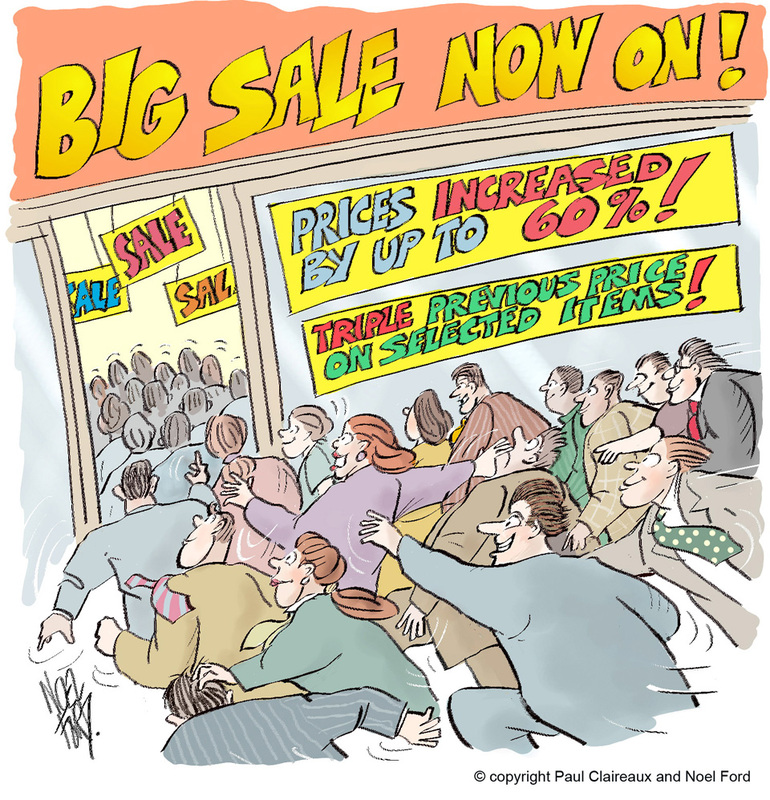 Warning 6 – some financial advisers ignore market valuations! They will tell you that stock markets are priced perfectly at all times AND that they’ll always produce good long term returns, regardless of when you go in. Now, I have to tell you – that’s NOT clever advice. 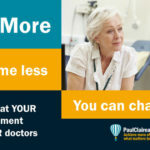 If you get that sort of advice – as many do – at the wrong time – it could seriously damage your wealth. And this adviser behaviour is in part to blame for the reality of this investor behaviour in this cartoon. So be careful how you choose your adviser/wealth manager and know what to ask them – before you appoint one. All advisers are not the same. 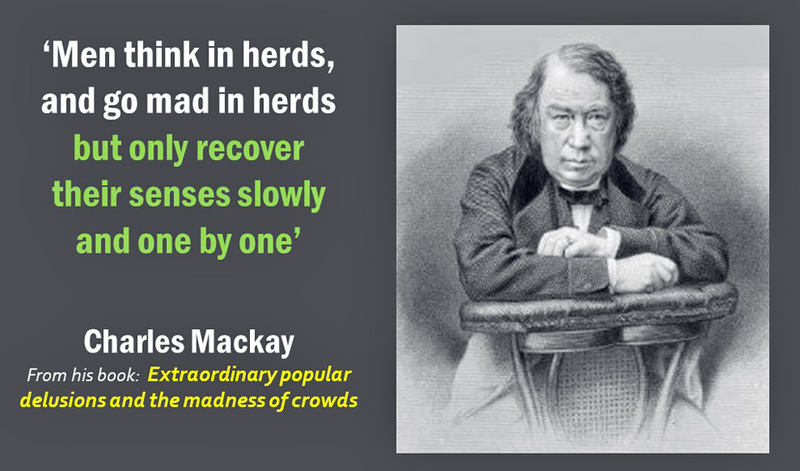 I’m grateful to my friends at Money Week for this one . . . But that’s not going to stop me from issuing these warnings . . .